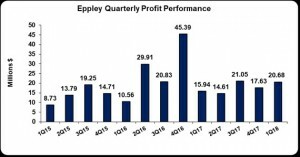 Eppley Limited (EPLY), for the first three months ended March 31, 2018 reported interest income of $73.71 million an increase of 18% when compared to the $62.54 million recorded the previous year. Interest expenses amounted to $45.11 million, a 22% increase when compared to $36.86 million for the corresponding period in 2017. Consequently, net interest income increased 11% to $28.61 million from $25.68 million for the corresponding period of 2017. Other operating income rose by $5.29 million to a total of $15.38 million relative to $10.09 million in 2017. Administrative expenses climbed by 20% to close at $24.31 million from $20.29 million the previous year. Notably, Eppley booked $1.01 million for Share of Net profit from Joint Venture compared to $467,000 for the prior financial year. As such, pre-tax profit closed at $20.68 million for the financial year, 30% more than the $15.94 million booked in 2017. No taxes were recorded for the period, hence net profit attributable to shareholders amounted to $20.68 million (2017: $15.94 million). Earnings per share for the quarter amounted to $0.11 (2017: $0.08). The trailing twelve months EPS is $0.38. The total amount of shares outstanding used for this calculation was 192,468,300 units. EPLY’s stock price closed the trading period on May 14, 2018 at $8.35. As at March 31, 2018, total assets amounted to $2.69 billion (2017: $2.05 billion), 31% more than its value a year ago. The increase in assets was driven primarily by increases in ‘Cash and Deposits’ by $286.21 million to close at $436.78 million (2017: $150.56 million). Investment Securities increased by $179.49 million (2017: Nil) also aided the movement in total assets. Shareholder’s Equity as at March 31, 2018 totalled $694.93 million (2017: $676.53 million) resulting in a book value per share of approximately $3.61 relative to $3.52 in 2017.